Mystic Seaport Wedding Photos show one of the most beautiful areas in Connecticut. The seaport is home to gorgeous waterfront views, that automatically impart a sense of calm on any scene. Mystic Seaport is also the location of the nation’s leading maritime museum. The museum was founded in 1929 and its grounds cover 19 acres along the Mystic River. The area contains many historic vessels, from the world’s sole surviving wooden whaleship, the Charles W. Morgan, to the last example of early 20th-century New England fishing vessels, the L.A. Dunton. The watercraft collection at Mystic Seaport is the largest of its kind in the United States and includes four National Historic Landmark vessels: the Morgan, the Dunton, the Sabino and the Emma C. Berry. 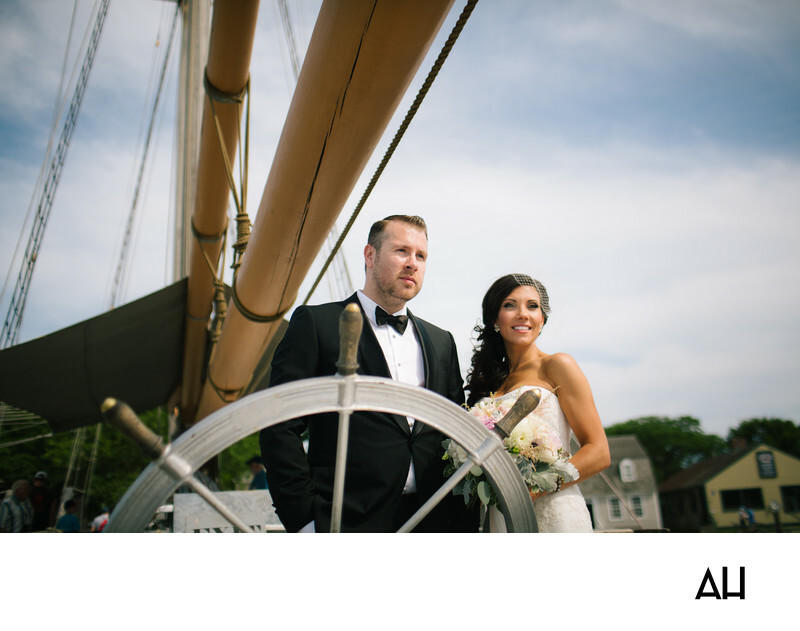 As a result of the history and beauty provided by these ship, many Mystic Seaport Wedding Photos are taken on the water. In this photograph, the bride and groom stand on a large, old, restored sailboat. The steering wheel of the boat is at the forefront of the picture, symbolic of the new direction the couple is now taking their relationship in. The sails are down because the newlyweds are in complete control of their own happiness on this special day. The groom looks steadily out at the horizon and the bride follows his gaze, a permanent smile gracing her face. The groom is dashing in a traditional black tuxedo and the bride radiant in her white gown. In place of a veil, the bride wears a headpiece with delicate netting shading part of her face. They create a timeless picture standing at the ship’s helm, looking out at the bright future before them.